As part of our weekly Christmas Sensory Play series this week we are exploring our sense of hearing! Toddlers typically love to make noise so we sure had a lot of fun with this activity. 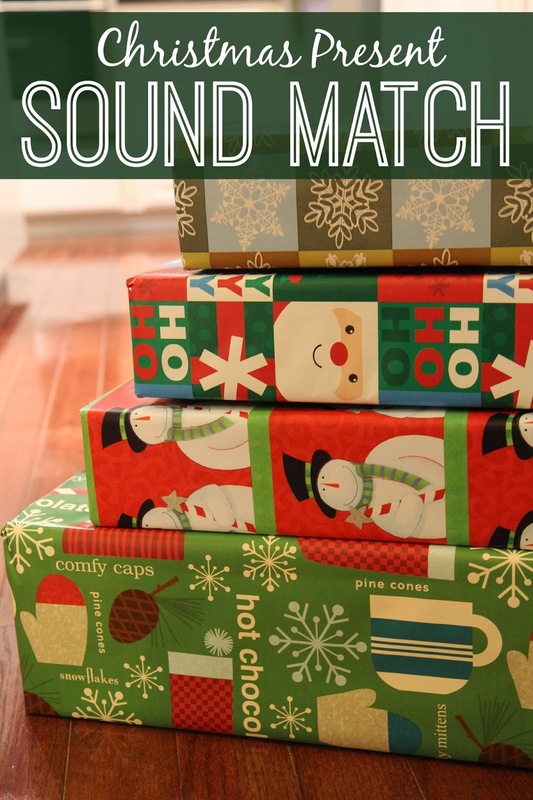 Our Christmas present sound match game for toddlers incorporated listening, matching, and moving while exploring our presents. All three of my kids (ages 6,3,2) had fun getting involved. To get started you need to gather a few materials and get some things prepared ahead of time. I tried to get the presents ready when no one else was around so that they didn't see which boxes I put each item inside. Put Christmasy items in boxes. Make sure that each box has a match- another box that has the same materials in it. For our first time playing this game we had two boxes with jingle bells in them, two boxes with pine cones in them, and two boxes with ornaments in them. Next you want to wrap up the boxes. I didn't use any fancy bows because I knew my toddler would just rip them right off. Make sure that the presents are covered in a variety of wrapping paper styles and that none of the matches are wrapped in the same wrapping paper. Once the presents were all filled and wrapped I took them into the room where my kids were playing and I put them on the floor. 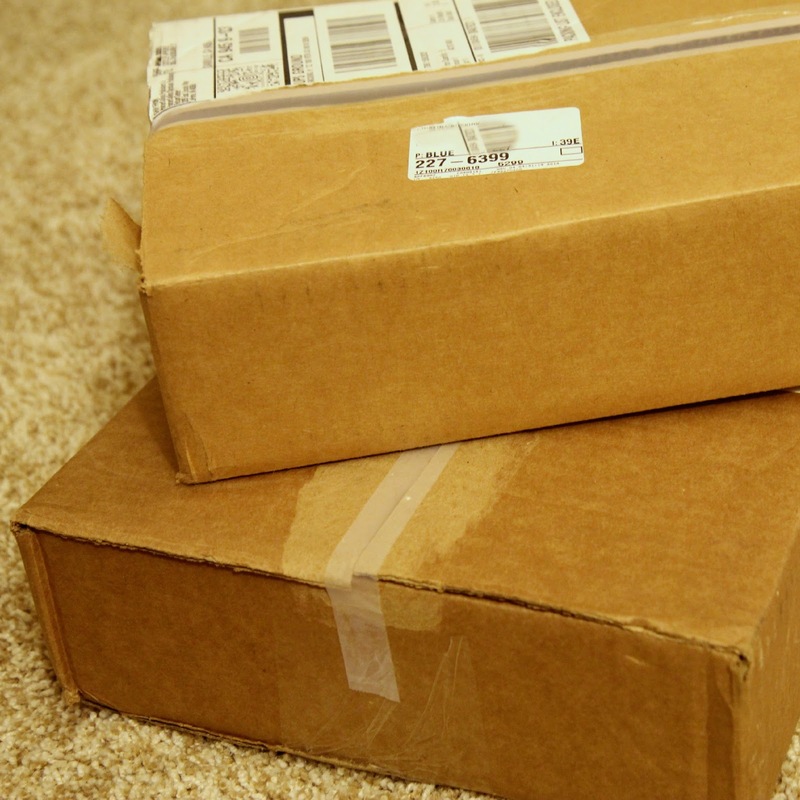 The kids immediately started picking up the packages and shaking them. They were so engaged and listening intently to try and figure out what was in each box without me even saying anything. 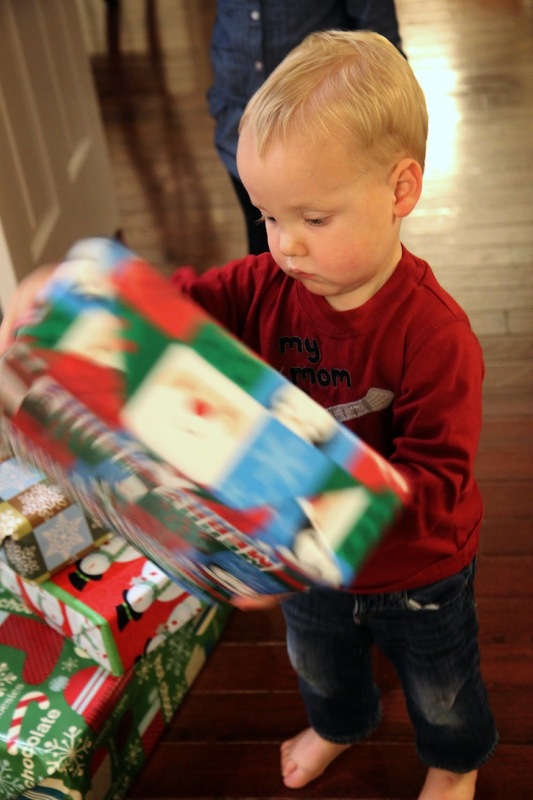 As my toddler started shaking one present I mention to him that we wanted to find another box that sounded the same as the one he was holding. He immediately started shaking each package and listening so carefully. 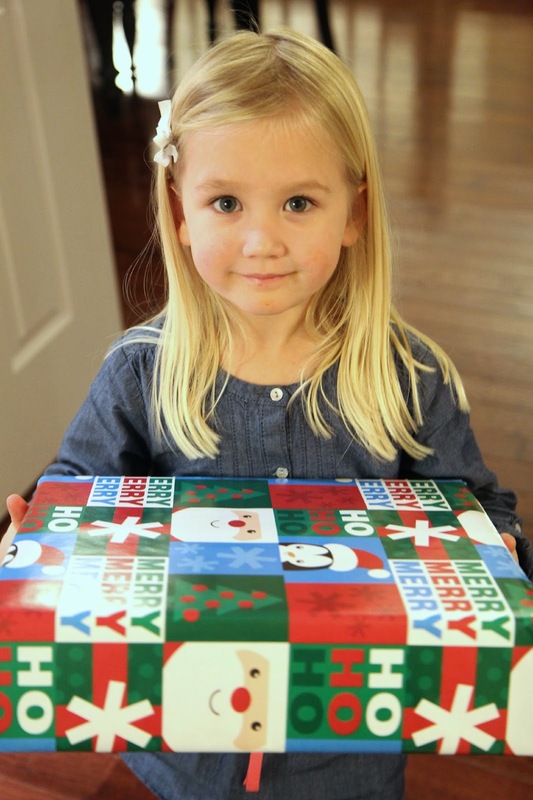 His big siblings joined in and everyone made guesses of what they thought was in each box. After they guessed for awhile I let them know which items I had collected to put in boxes and then that helped them figure a few things out. I loved how much my toddler just loved shaking the boxes. The big kids were interested in the shaking but really wanted to open the presents and actually see what was inside. The toddler however was pretty content to just shake and listen to the different materials. Once he figured out which boxes had the same sounds inside, then I helped him stack the boxes that matched together. The bigger kids helped too. For older kids using more smaller boxes with even more Christmasy items to listen to would make this even more fun! We also built some present towers using these boxes once they were done. I can't wait to add some more favorite Christmasy items to these boxes next week when we officially get out our Christmas stuff and start decorating. Do you have any other suggestions of items you could put in a box for our Christmas present sound match game? Throughout the next several weeks we'll be bringing you a SeeHearTouchTasteSmell Christmas Sensory play series, featuring creative activities that help children to explore the season using their senses. This week’s activities are all focused on using our sense of HEARING. Here are several of the other activities shared this week! 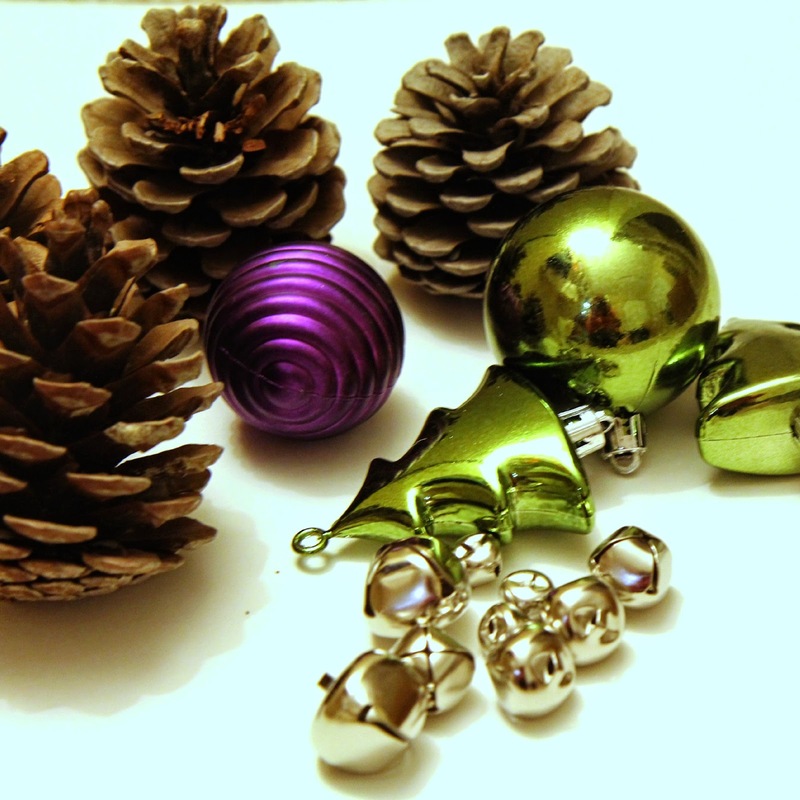 Cathy at NurtureStore shares some cool Christmas Listening Games that go along perfectly with our sound matching activity. Kate at Picklebums has a Christmas Drawing and Listening Game that looks like it will be fun. Christie at Childhood 101 has a neat movement activity and obstacle course where you tell the kids Don't Ring the Bells! My kids would get a kick out of it! Do you have any favorite Christmas activities you've tried using your sense of hearing? I'd love you to share them with me! Since we love the sound of jingle bells at Christmas time here are two other activities we always love to do Jingle Bell painting & a Jingle Bell toss. If you haven't tried them yet, do it! Your kids look like they had such a fun time with this game! I bet your kids loved this game! 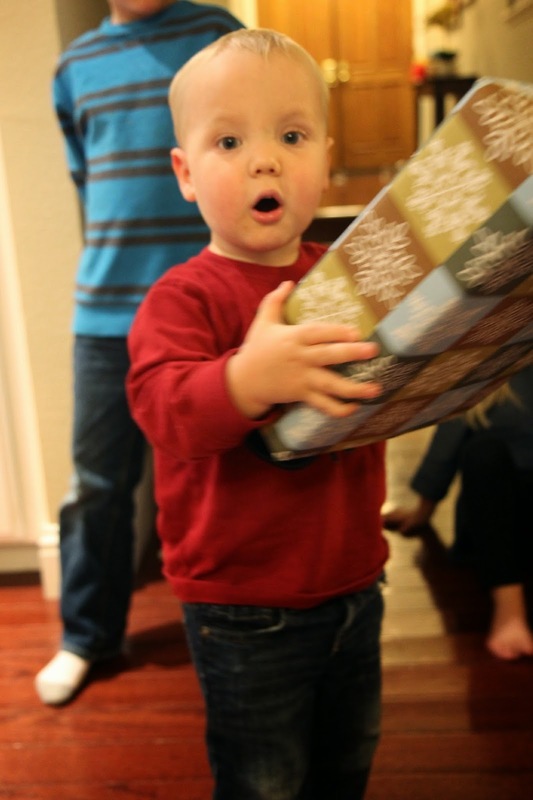 I always remember how much fun it was to find a present that rattled under the tree and try and guess what was insane!